Former Indonesian first lady Dewi Sukarno (69, profile) may not be my cup of tea but I have to hand it to her – she knows how to stick up for herself. After her recent comment criticizing Japan’s “over reaction” to the North Korean missile launch on April 5, a member of an “uyoku” (right wing ultra-nationalist) organization decided to broadcast from one of their infamous black sound trucks outside her home in Shibuya, Tokyo on Sunday morning. Dewi-fujin, as the Japanese native is popularly known, clearly took offense and decided the best form of defense was attack. She launched a few missiles of her own – three flower pots, to be exact – from a second-floor balcony and caused some damage to the truck. This of course led to a face off during which her camera is said to have been broken. Police from the local Shibuya station are looking into the matter. Sukarno was working as a teenage bar hostess in Ginza when she was swept away to become one of the many wives of first Indonesian president Achmed Sukarno in 1959. She returned to become a popular face on the Japanese variety show circuit in the mid-1990s. Singer Okamoto Shin was found dead in his Tokyo home yesterday afternoon, on the very day that friends had planned a major birthday celebration. A spokesperson for the Takinogawa police station said that they were called by a friend of Okamoto, who visited his home in Kita Ward after being unable to contact him only to find the singer dead in his bathtub. The police are investigating the cause of death but they believe it was from natural causes. Okamoto was to turn 60 today, an important milestone celebrated in Japan as “kanreki,” and friends had planned to hold an early birthday party in Yokohama last night. Fellow members of the popular 60s rock band the Jaguars expressed their shock at the sudden death of the band’s vocalist, though he had been having health problems for several years. Drummer and band leader Miya Yukio (65) said, “When I met him a year or two ago, he said he wasn’t well. I asked him to take better care of himself. But I can’t believe he died before me.” Lead guitarist Okitsu Hisayuki (62) said he hoped to perform a memorial concert for his friend of 40 years. 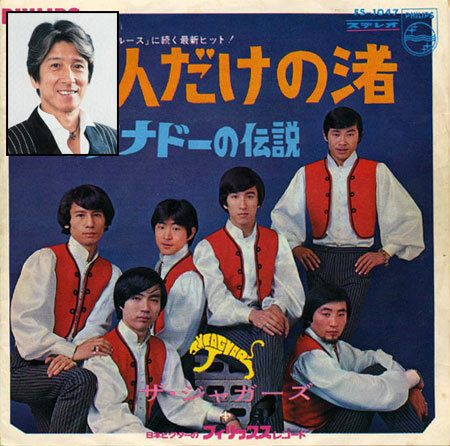 After their debut single, “Kimi ni Aitai” became a million seller in 1967, the Jaguars were one of the biggest bands of the short-lived and highly commercial Group Sounds scene. Like most of the major GS acts, they split in 1971 but they did get back together again briefly a decade later. Okamoto performed a concert in February 2008 to celebrate his 40 years in showbiz.